Ann Arbor Mayor John Hieftje, Huron River Watershed Director Elizabeth Riggs, Assistant Manager of External Affairs at Toyota’s Planning Center Cindy Mahalak, and AAPS Superintendent Dr. Patricia Green. You may have noticed a big addition to the Tappan Middle School parking lot this week. It was a double-wide trailer, emblazoned with blue waves, visible to drivers on East Stadium Boulevard. It was stationed there Monday night, and by Wednesday morning it was gone. Despite its short stay, that trailer is sure to have a lasting impact: it was the Wyland Foundation’s Clean Water Mobile Learning Experience (MLE) and it provided Tappan sixth graders interactive lessons about water conservation. 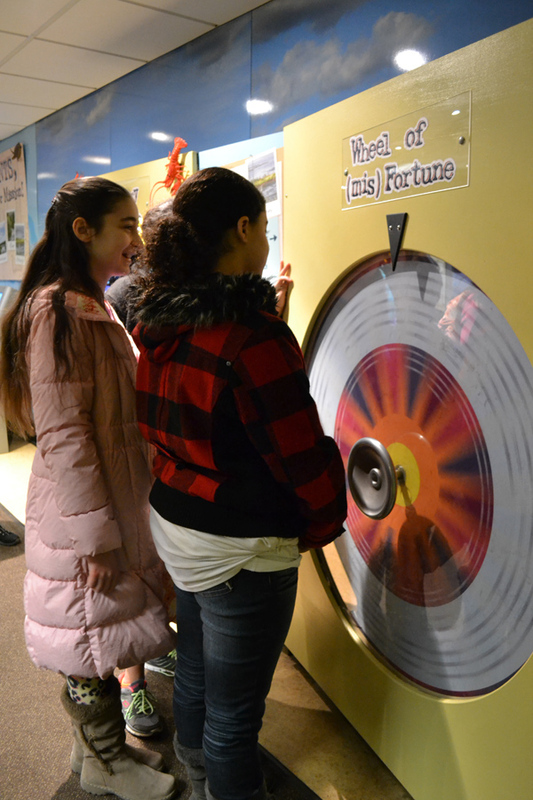 Tappan sixth graders learned about the effects of development on a lake region in the Wayland Foundation’s Clean Water Mobile Learning Experience March 26. 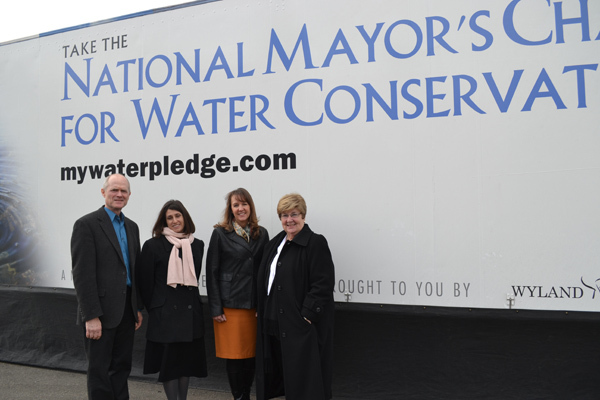 The MLE also provided a great opportunity for Ann Arbor Mayor John Hieftje to share the city’s participation in the National Mayor’s Challenge for Water Conservation, which challenges residents to reduce water and energy during Earth Month in April. Ann Arbor is a unique place in Michigan, with plentiful access to award-winning water, the mayor told the sixth graders Tuesday morning. “There are very few places in the world that have the abundance of fresh water that we do here in Ann Arbor,” Mayor Hieftje explained. The city uses a process called reverse osmosis when it treats its water, which is the same process bottled water companies use. Elizabeth Riggs, from the Huron River Watershed Council, gave students ways to become “H20 Heroes:” students can take shorter showers, turn off the tap when they brush their teeth, and make sure not to waste food, which needs a lot of water to process and grow. The Clean Water Mobile Learning Experience is sponsored by Toyota. 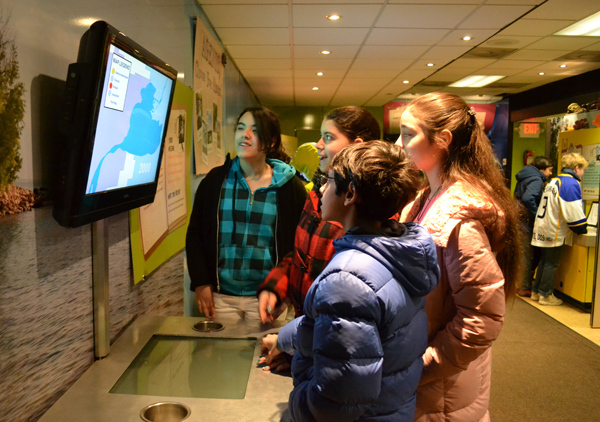 The mobile learning lab, which is sponsored by Toyota, provided students a menagerie of hands-on activities to learn all about how lakes, wetlands, rivers and estuaries are affected by natural and unnatural influences. They learned about the price of development and what happens when a lake region is used too much. They learned how the estuary food web is affected when one species goes extinct. They learned about the effects of pollutants and over-fishing. Sixth graders toured the lab during the school day on Tuesday, and it was also open to the public Tuesday evening. The Wyland Foundation is a non-profit organization dedicated to promoting, protecting and preserving the world’s oceans, waterways and marine life. The foundation encourages awareness through education programs, public art projects and community events. 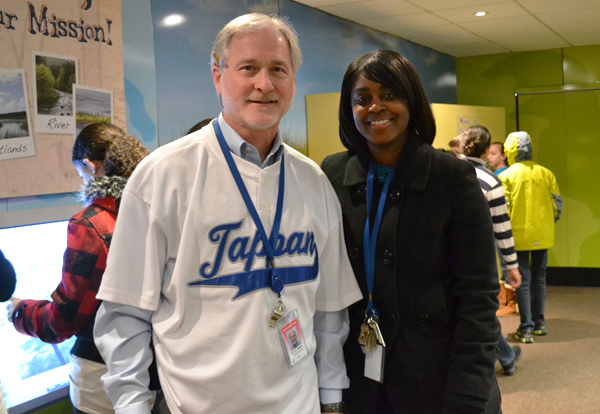 Tappan Assistant Principal Rick Weiler and Principal Jazz Parks.